Think you’ve seen all Dubai has to offer? Think again; this city is full of quirky surprises. 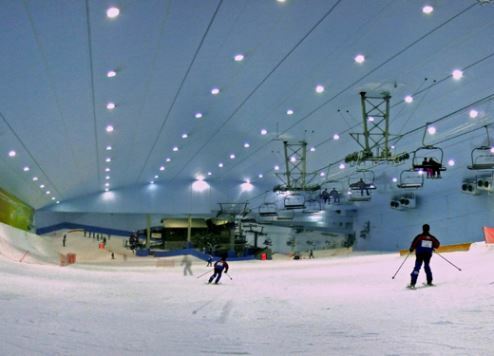 Camp out at Ski Dubai If you really want to beat the heat, the slopes of Ski Dubai offer year-round sub-zero temperatures and on Friday nights, you can even stay there overnight. Ski Dubai Camp Outs are now on offer, giving visitors the chance to sleep in a two-man tent set up with sleeping bags and a thermal mattress. Guests are also given after-hours access to the ski resort and all of the snow park facilities, plus gloves, jackets and beanie hats to keep them warm during their stay in the -4°C conditions. They are also treated to breakfast in the on-site St Moritz Café. Sleep with the fishes……And live to tell the tale! Wake up to an audience of 65,000 difference marine species in your underwater suite at Atlantis, The Palm. The underwater suites, named Poseidon and Neptune, are located in the mega resort’s Ambassador Lagoon. Popular with visiting celebrities, the rooms feature floor-to-ceiling views from the bedrooms, lounge and even the bathrooms. But it won’t come cheap, with stays priced around $8,000 a night. Skydive over The Palm Jumeirah For a unique and exhilarating experience that will take you sky high – literally – try a sky dive over The Palm Jumeirah and take in stunning views of this man-made Palm-shaped island. Skydive Dubai instructors will coach you through the jump – or join you for a tandem one. Either way, it’s a Dubai-style adrenalin rush you won’t forget. Play polo – on a camel Grab a mallet, jump on a camel, and gallop about the pitch while trying to hit a ball at Dubai Polo & Equestrian Club where camel polo is all the rage. Do it as a group or join other solo players for a fun bludgeoning match in the sun. Watch a gig at the airport Dubai International Airport (DXB) is the latest venue of choice for up-and-coming rock, pop and jazz stars. The Zen Garden at the airport’s Concourse B is playing host to a number of musical artistes as part of an initiative it’s dubbed MusicDXB. It means passengers travelling through DXB can catch a band before or after they catch a flight. Hot air balloon over the desert Enjoy a magic carpet ride over Dubai’s colourful desert as the sun sets or rises over the horizon. Spot indigenous animals like Oryx and spot the green oases dotted amongst the dunes as the team of experienced and skillful pilots at Balloon Adventures Emirates guide you through the sunny skies of Dubai. Watch a camel race with robot jockeys Camel racing – the sport of sheikhs – has been part of Emirati life for centuries and a modern-day version of this age-old tradition can be found at the Al Marmoum Racetrack. Grab your binoculars and watch from the grandstand as 60 camels race from the gates. What they lack in elegance they make up for in speed, their spindly legs and knobbly knees splaying out in all directions as they race down the track at up to 40km/h, ridden by remote-controlled robot jockeys that control the whip and the reins. Swim with sharks Come face to face with the ocean’s ultimate predator - sand tiger sharks – in the Dubai Aquarium and Underwater Zoo’s 10-million-litre tank. Three shark dives are held each day, allowing up to four divers in each group to explore this wonderful underwater world. Qualified divers can jump straight in, but non-qualified divers must complete a short course. Bounce off the walls Flip Out opened in Al Quoz in March this year – an indoor activity centre with more than 200 interconnected trampolines, as well as 10 trampoline-based attractions including trampoline football, basketball, volleyball, dodgeball and massive foam pits. There’s also archery tag, a combination of dodgeball and paintball, where archery tag players use foam-tipped arrows to hit their opponents. Surf in the dunes Jump on board a 4x4 and hit the dunes with Explorer Tours, which promises heart-pumping action in the desert. Start with an energetic dune bash before strapping on your sand board and riding the steep slopes of the desert at speed. There’s also a camel ride thrown in for good measure during this four-hour safari.